Have you ever wanted to invite a gardening professional to your home to help you solve your landscape problems? Well, now you can. I am available to do gardening consultations in the Seattle area. I've been doing these "horticultural house calls," formally and informally, for 20 years and enjoy sharing my knowledge with others. In the years I've worked in the landscape industry, I've seen how many people spend too much money on trial and error. They buy tools they don't need, chemicals that aren't necessary and plants that aren't suited to their gardens. Let me help you avoid all of that. If you want color in your garden all year around, I suggest that you think in terms of foliage colors first and then use flower colors as accents. Why not plan around flower color? Because the flowers of perennials and woody plants don't last very long. 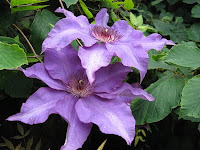 You wait all year to see those beloved peonies or rhododendrons or daylilies open up. When they bloom, the flowers last anywhere from a few days to a couple of weeks and then that's it for the year. You can add color to the garden for a longer period using annuals, but replacing them every year and keeping them looking good can be an expensive and high maintenance project. To get ideas, look at gardens in your neighborhood. Here you see a lot of color and not a flower in sight! Visit public gardens, too. This photo was taken in the Coenosium Rock Garden at South Seattle Community College. 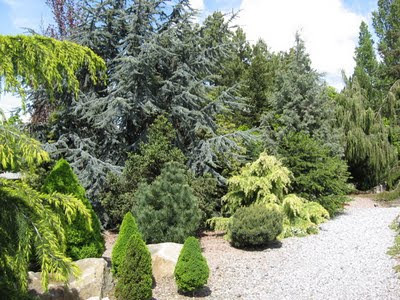 The garden features an outstanding collection of conifers and look at all that color! There's the blue Atlas cedar (Cedrus atlantica), the kelly green of the dwarf Alberta spruce (Picea g. albertiana 'Conica'), yellow green of deodar cedar (Cedrus deodora), and pines (Pinus sp.) in various shades of green. Foliage color may be deciduous like the purple smoke tree (Cotinus coggygria), or evergreen like the heavenly bamboo (Nandina domestica 'Moon Bay') shown above. 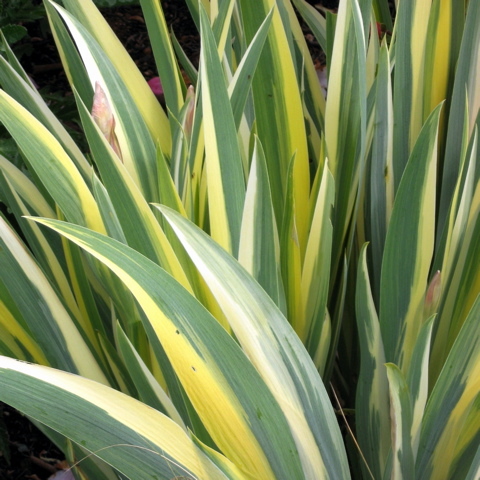 Look also for variegation in foliage, like this iris. And don't forget grasses. 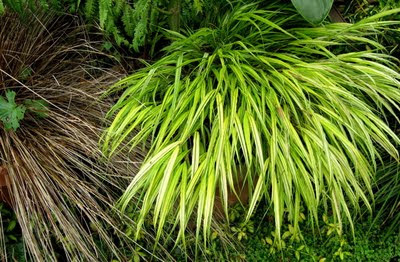 Here you see Japanese forest grass (Hakonechloa macra) on the right and bronze leather leaf sedge (Carex buchananii) at the left. If you want more blue in your landscape, look for blue oat grass (Helictotrichon sempervirens) or blue fescue (Festuca glauca 'Elijah Blue'). Need more ideas? "Consider the Leaf: Foliage in Garden Design ," by Judy Glattstein goes much more in depth. She writes in a comfortable, conversational style, making it enjoyable to learn from her about how to bring lots of color with less effort into your garden. Some of these shrubs are David's and some are Marie's. 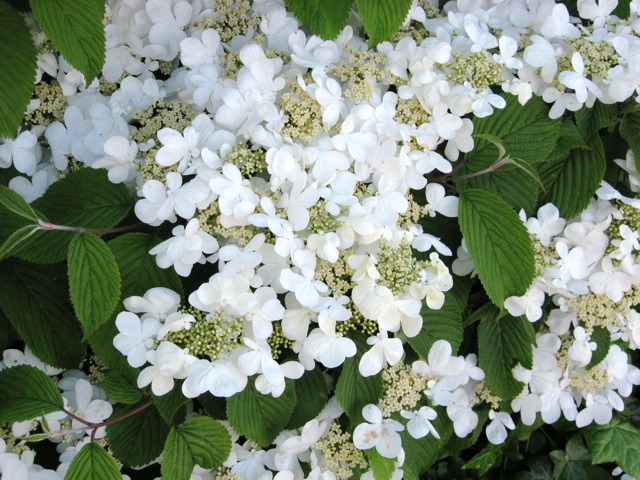 Others are known as Spring Bouquets or Snowball Trees. Some have names like Korean Spice, Pink Dawn, and Highbush Cranberry. Some are tall. Some are short. Some are evergreen. Some lose their leaves in a fiery display in fall. Despite their differences, what these all plants have in common is that they are members of that large group of shrubs called Viburnums. 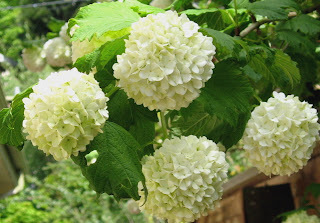 One of these in bloom now in Seattle is the Common Snowball (Viburnum opulus 'Roseum'). One look at these perfectly round clusters of flowers and you see where this plant got its common name. 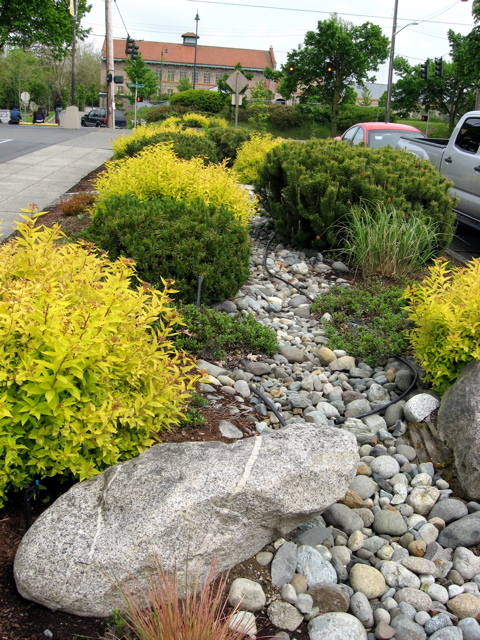 These shrubs can be trained into small trees, 8-10' high and 10-12' wide. Fall color is stunning most years, with those maple-like leaves turning deep rusty red. My landscape design instructor used to say, "The trouble with common plants is that they are used commonly." I think of that quote when I see bedraggled specimens of David's viburnum (Viburnum davidii) used to edge the parking lot of a strip mall. 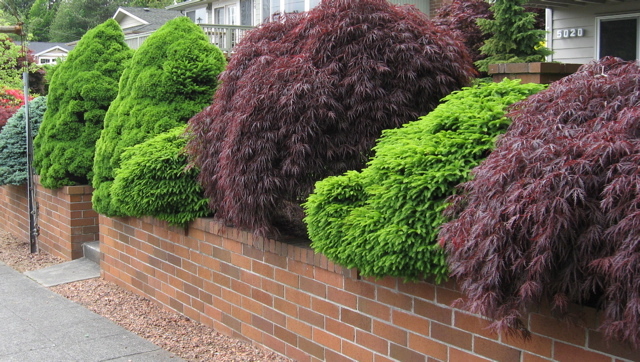 These handsome evergreens deserve better treatment than they often get. 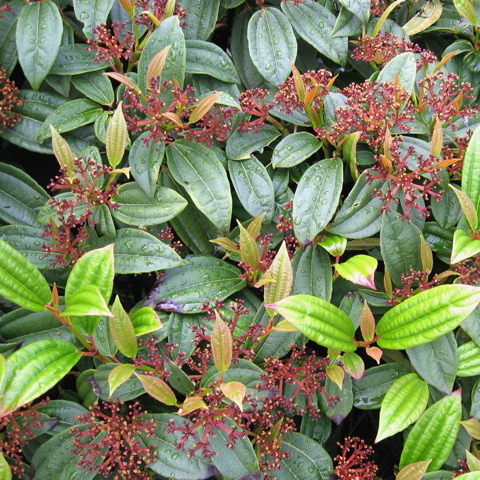 With deeply textured, dark green leaves, a row of these shrubs make an attractive low (3-4') hedge. 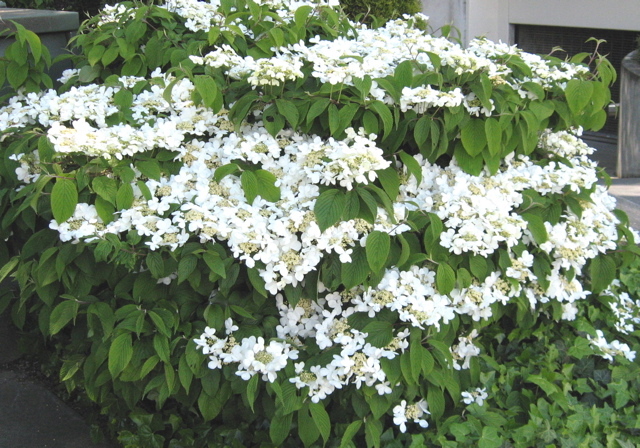 In spring, clusters of white flowers open from those pink branches you see above. The flowers are followed by iridescent blue berries in fall. V. davidii does very well in our acid soils and tolerates partial shade. 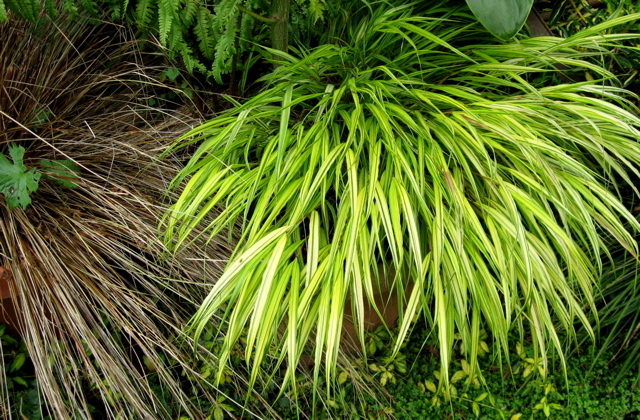 With very little care, these plants offer great reward in the landscape. I'm afraid that gardeners often avoid using them because they've only seen them used "commonly." I encourage you to explore some uncommon uses for this plant. It probably comes as no surprise that I am partial to the viburnum that shares my name, Marie's viburnum, also called Doublefile viburnum (V. plicatum tomentosum 'Mariesii'). You can see this plant in bloom all over Seattle right now. Alas, I do not have room in my little garden for this shrub which gets about 10' tall and spreads a good 10-12' wide. Here's a closer look at the flowers. Row upon row of these lace caps make this one very showy plant in spring. In fall, the leaves turn brilliant red before they drop. This is the first of what I intend to be a series of posts highlighting commercial landscapes done well. This time I am featuring one of my favorite grocery stores, the West Seattle PCC. For those of you unfamiliar with this store, PCC stands for Puget Consumers Co-op. With 9 stores in the area, it is the largest community-owned and operated natural food retailer in the US. Because of the co-op's mission, it is no surprise that the block-long parking strip running from California Ave SW to 44th Ave SW has been made into a colorful garden. What is surprising is that, despite being a high traffic area, this garden looks good all year around, year after year. One reason for its success is that it has a central design element that ties it all together. That element is the dry stream bed that has been constructed down the center. Large pieces of granite flank the sides, with river rock filling the depression down the middle. 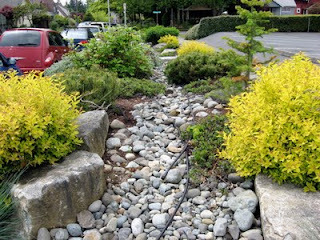 Planting areas are bermed slightly on each side to accentuate the stream bed effect. Another reason for this garden's success is that it is colorful. 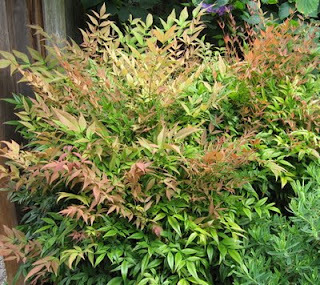 Here we see the yellow of Spirea 'Goldflame' in the foreground. Other plants that add color include: Rosa rugosa, Oregon grape (Mahonia sp. ), ornamental grasses, and heathers/heaths. Plus, there are various shades of green found in the Mugo pines, Alpine fir, kinnickinnick and other ground covers. Two driveways cut through this garden to allow access to the store's parking lot. As a driver who goes in and out of there often, I appreciate the fact that none of the plants are tall enough to obstruct my view of oncoming traffic. This is something for homeowners to keep in mind if they decide to convert their parking strips to planting strips. Are there commercial landscapes in your Seattle neighborhood that you particularly appreciate? I'd love to hear about them.